In lieu of makeup, I looked through my photo albums for pictures of appetizing food (surprisingly scarce) and came across this one taken two Thanksgivings ago. My family took a vacation to Japan and we stayed at an onsen ryokan (roughly translated: hot spring inn) for a couple of days. 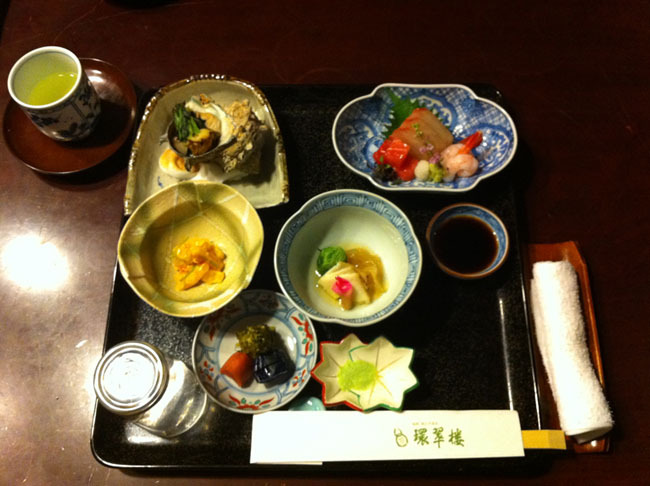 At night, they served us magnificent kaiseki dinners and if I recall, this was one of the appetizers. All that is just to say, I'm so ready to eat like a pig tonight. Happy Thanksgiving, everyone! Happy thanksgiving to you too, love! That all looks delicious! Happy Thanksgiving! Happy Thanksgiving to you too, Jo! Can I ask which Onsen Ryokan did you go to? Was it easy to book and would you recommend it? I definitely recommend staying with them. The service+food was impeccable and you will be nestled within the trees. Location was convenient too as it was near the train station. It was very very pricey though.